Ladies and gents, hold on to your hats, it’s getting wild in here! 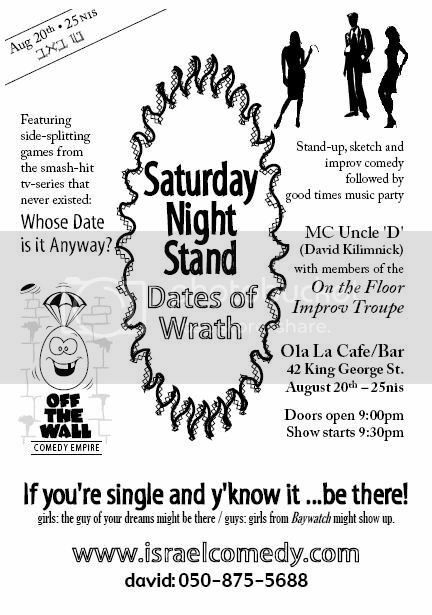 A comedic diversion in to the world of singles and dating, brought to you by Off The Wall Comedy Empire and On the Floor Improv Troupe (that’s us – me an’ my homies). Drop me a line if you’re coming, ok? Previous Previous post: ONE TIME ONLY! EXTREE, EXTREE, MIKE POSTS SOMETHING IN HEBREW!!! Next Next post: Another show? So soon?